Call, text, or email owner for discounts and last minute deals. 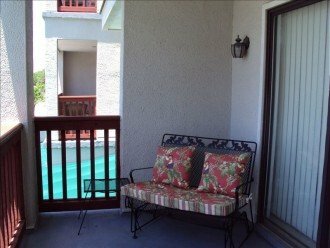 Beautiful, newly remodeled one bedroom, Panama City Beach/Gulf Coast vacation condo for rent by owner. Come enjoy all the beauty, relaxation and entertainment that a Panama City Beach vacation has to offer. Surrounded by water, our St Thomas Square Resort condo has the most coveted location in the area. We are nestled between the glimmering emerald waters of the Gulf of Mexico and the Grand Lagoon offering immediate access to everything each has to offer. Relax on the sugar-white sandy beaches or by our pristine pool, go deep sea fishing, or experience the daytime fun and nighttime excitement of Panama City Beach's Pier Park, St Andrews State Park, & St. Andrews Bay Historic District. Our family oriented complex is on the Grand Lagoon, situated between it and the Gulf, with direct access by boat or jet ski to Capt. Anderson's Marina and Restaurant, St. Andrews State Park, Shell Island, and the deeper waters of the Gulf of Mexico. Bring or rent your boat, skis, and wave runner. 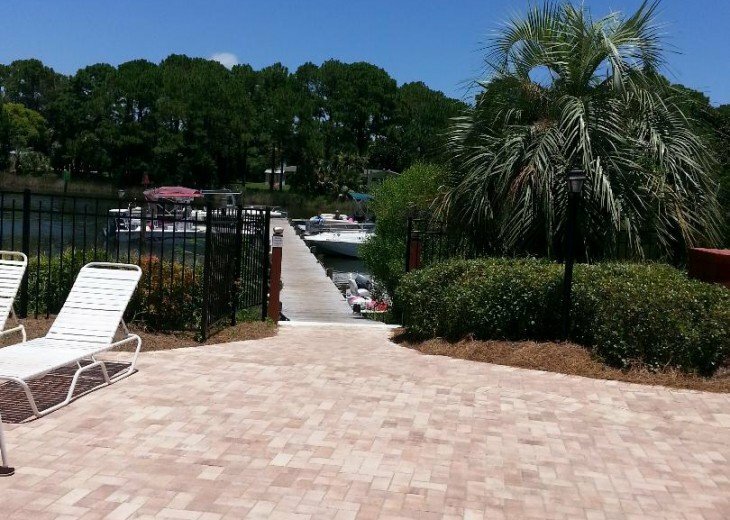 Enjoy use of our free private boat dock and slip during your stay. Additional parking with wash-down station for your boat and trailer is provided. 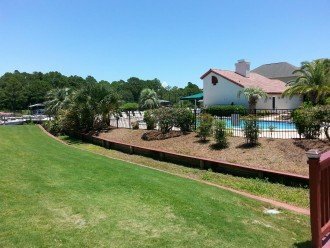 The resort houses Guadalajara Mexican Restaurant, PCB Winery, Deja Brew coffee shop, and several specialty shops right on the premises. You'll find our condominium tastefully decorated with a large private master bedroom and comfy queen bed, TV/DVD, free, secure high speed internet, walk-in closet, and adjoining clean, spacious bath. The kitchen is fully equipped, and stocked with everything you need and then some with two pantries, one with washer and dryer. The dining area seats four with room for two more at the bar. The living area has a super comfy queen murphy cabinet bed plus a chair and a half that converts to a twin sleeper. Enjoy browsing the internet or watching Netflix on the Smart TV. Blu-Ray player and video/book/game library are also provided. 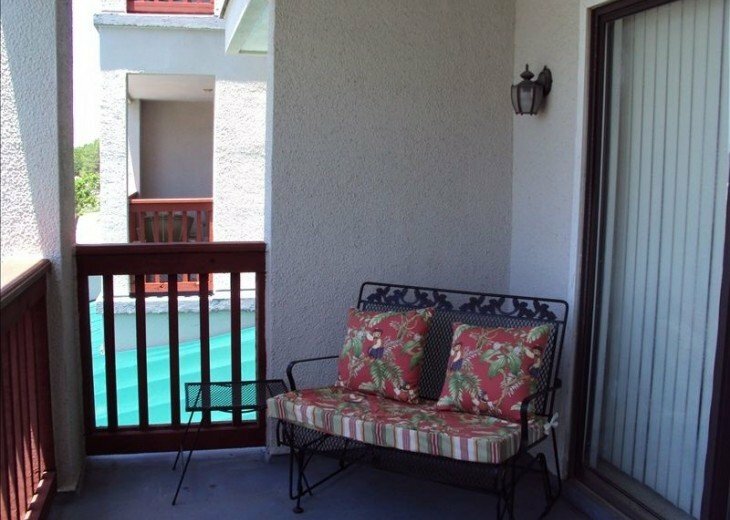 You'll delight in the large balcony with double gliding rockers. We supply a one time setup of bath tissue, soap, dishwasher detergent, paper towels, and trash bags. All linens provided except beach towels. 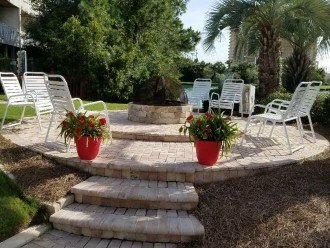 We have a resort style pool with sauna, restrooms and shower, fire-pit, covered barbecue grill area, lighted tennis courts, boat docks with water and electricity. Our condo is centrally located on Thomas Drive and just across the street from what many call 'the world's most beautiful beaches'. Once you're here, park the car and forget it. No need to drive anywhere! We are one of only a handful of Panama City Beach resorts offering its guests free use of the boat docks and slips with direct Gulf access by boat. We are the ONLY resort in the area whose location boasts the above amenities while remaining within steps of the beach! For the kids, Emerald Falls Amusement Park and Wendy's adjoin the property on the east-no streets to cross. 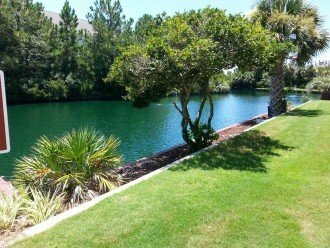 They'll love fishing or setting a crab trap from the dock, and playing tennis or shuffleboard! A fabulous Mexican Restaurant, Coffee shop, Winery, and small grocery are all located within the complex. Hammerhead Fred's Seafood and Subway are just across the street. For nightly entertainment, Spinnaker/ Club La'Vila and Ms. Newby's are across Thomas Drive, all within a block, and only a short stroll away. Signal Hill Golfing is within a half mile and St. Andrews State Park is approx. 4 miles down. Pier Park (west end beaches), Historic St Andrews Bay and Harbor are within a short drive. St Thomas Square Resort, 8730 Thomas Drive. Panama City Beach, Florida, Gulf Coast, Gulf Lagoon Beach, Grand Lagoon, East end beaches near St. Andrews State Park. Location, location, location! Everything you could need or want is truly within a short walk! See comments left by prior guests. We are located at the corner of Joan Ave. and Thomas Drive. Parasailing or jet-skis on the beach. Tennis, fishing or setting crab traps from our dock. Beautiful pool with clean restrooms, BBQ grills, covered seating area, and vending machines. Emerald Falls Amusement Park and the Slingshot are both within a safe walk (both visible)from the condo. Zoo World, Coconut Grove and Ripley's within 1.5 miles. Simply too much to list! On Grand Lagoon/Popular East End Beaches/St Andrews State Park area. Multiple grocery stores plus Walmart are all within 3-5 miles. Cross the street to the beach. Paved sidewalk leads straight to the beach. Free public parking as well. Direct access to the Gulf by boat on Grand Lagoon. Approximately 2 mile ride from our condo's dock to Capt. Anderson's Marina, St. Andrews State Park, Shell Island, and the Gulf of Mexico. Free use of our dock and boat slips during your stay. Electricity provided on docks. Protected waters of the Lagoon allow for skiing, fishing, and jet skis. Community Pool with sauna, clubhouse, restrooms, BBQ grills, lighted tennis courts, and shuffleboard. Peak season, from last week of May though mid-August, require a weekly reserve. Rates include all fees except lodging tax and end of stay cleaning- No additional booking or processing fees! Primary renter must be minimum 25 years old- no exceptions please. Signed rental agreement required for all bookings. Fully refundable security deposit of $150 ($200 for monthly reserves)due at the time of booking to hold reservation. The deposit serves as a reservation deposit, then converts to a damage deposit upon check-in. Deposit is fully refunded within 10 business days pending housekeeping report. No pets/ No smoking. If bringing a boat with trailer, a registration tag is required- please add one time $25 fee. About the owner: Owner since 2006. We love the beach and especially the PCB area. 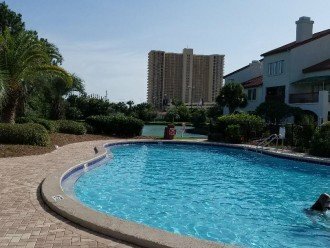 We've been renting our condo by owner since 2008 and appreciate our many great return guests and look forward to establishing new relationships. Why this property? Our condo provides the best of both worlds. 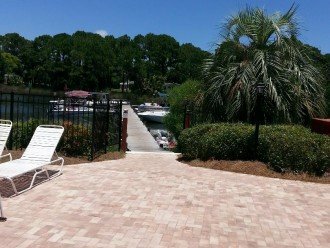 We're able to bring our boat and jet-ski and keep both securely docked right at the condo throughout our stay. No need to take in and out of the water at the end of each day is so nice! 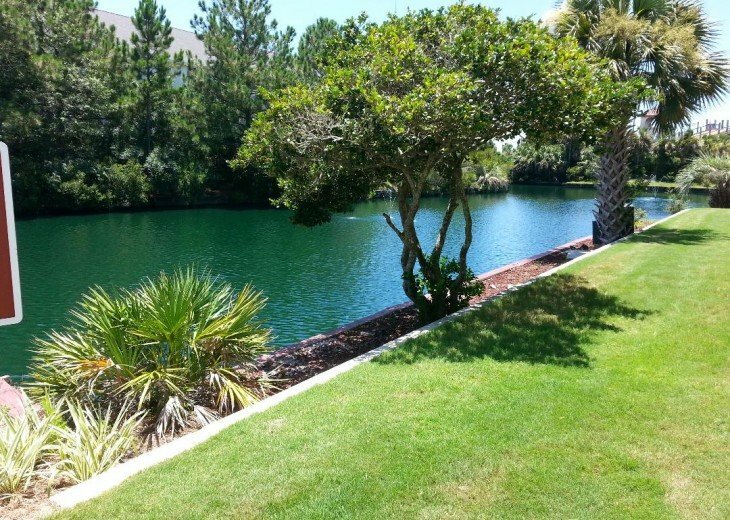 The kids and grand kids love fishing and crabbing from the dock, and we love being able to cook it all up right there at the clubhouse, enjoy eating together outside with beautiful views of the Lagoon and pool, all without having to make a mess inside! We usually walk over to the beach, but when loaded with kid's toys, chairs, etc. really appreciate being able to drive over and unload everything right in front of the boardwalk before parking. St Andrews State Park is beautiful just to spend the day, but also offers excellent fishing without taking the boat out. We find the location perfect, as it has everything our family enjoys doing without the crowded beaches and long restaurant waits associated with the west end beaches. By the way, Pier Park is a must visit! Great shopping and eats, plus the public pier which rents fishing tackle and sells daily or hourly passes is great fun for the kids. We loved our stay here. Every thing was so clean and nicely decorated. There were little touches every where that made you feel welcome. I like that they had beach chairs/ boogey boards and beach umbrella available in the closet to use at the beach. The bed was so comfortable! The location was a little far to walk to the beach if you had a lot to carry but there is parking across the street for the beach and we would drive over. I will def. be staying here again. Super clean and convenient to everything! Great experience! Clean home, will come again.